It's still too early for summer produce, yet I'm already longing for tomatoes to pair with the fresh basil coming from my herb garden. To satisfy that craving, I came up with this "first hints of summer" salad, playing on ingredients common to my favorite summer salads: heirloom tomato panzanella and insalata caprese. Because I've been on a smoky kick, I used smoked mozzarella in place of fresh, which seems appropriate for these transitional weeks as spring turns to summer. 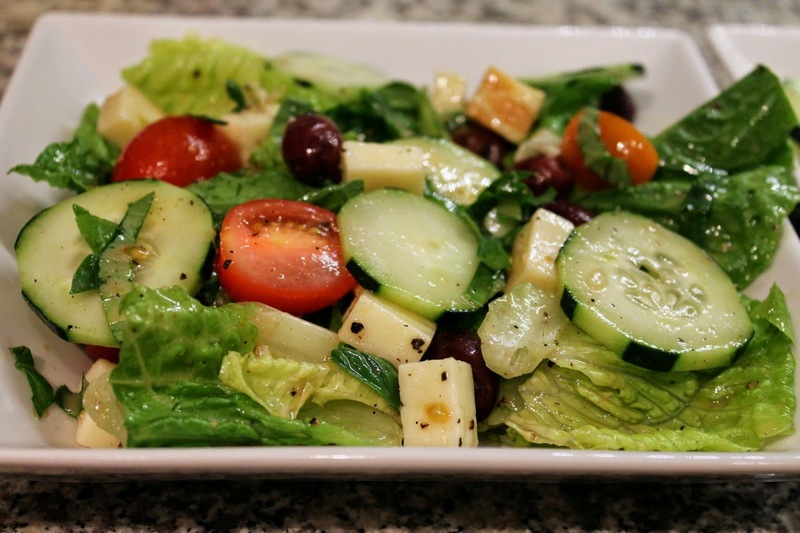 Combine the lettuce, tomatoes, cucumber, cheese, olives and basil in a large bowl. Whisk together the olive oil, vinegar, mustard, salt and pepper in a small bowl. Pour the dressing over the salad and toss to combine. Serve in shallow bowls.